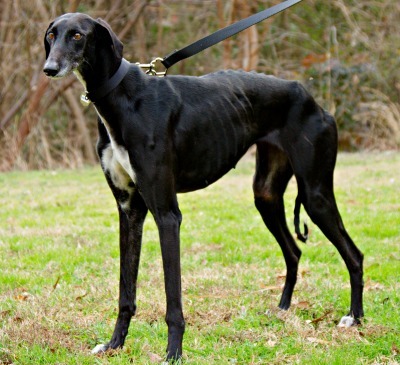 Venus is an approximately 3 1/2 year old black female greyhound/saluki mix. She was captured as a stray in Johnson county close to the town Venus. Although she is heartworm negative, Venus has a positive titer to Ehrlichia Canis. Treatment has started and will continue for approximately 8 weeks. It is not known at this time if Venus is small animal or cat tolerant. Venus has been successfully treated for Ehrlichia Canis and has completed all her medical procedures. This beautiful girl is ready to find her forever home.